Sorry this is late, my computer has finally given up! I've been so excited since I found out sinful colors had arrived in the UK, I went straight off to so many boots only to find they'd practically sold out at each one, but I finally got a hold of some! Nail Junkie- This one surprised me, I liked it in the bottle but on the nails I love it! Plus the name completely drew me in, I am a complete Nail Junkie. It's a jelly polish, green and packed full of holographic glitter in green/gold and silver, I can see this becoming a new favourite, I'd go with 2-3 coats. Kissy- A green-blue jelly with tons of gold shimmer, this one is different to anything I already have, for the price I thought I might as well pick it up. I thought it was alright with 2 coats but it might be the best with 3. Mint Apple- This one I was most excited to pick up, due to my mint obsession! It's a shimmery green, the shimmer is gold which makes it very different to any of my other mint polishes, I like it but I can't say it's my favourite. It's good with about 1-2 coats. Pink Glitter- I was desperate to get this one, but every boots I went to was sold out, so when I saw one lurking on a shelf the other day I grabbed it quick and I love it, it's a jelly glittery pink, the glitter is holographic and it also has a holographic shimmer to it, I like it with 2 maybe 3 coats. Glass Pink - I picked this one up as I don't really have anything like it, It's a very sheer polish which I wasn't really expecting, it's a lovely shimmery pink colour, but I think it really needs 3-4 coats until its opaque. I can't wait to get my hands on more! The colour selection is really good and the wear on them is amazing for £1.99, I had Mint Apple on for 5 days till it started to chip with no topcoat! I'm extremely impressed with these and will probably end up with even more, you can get them in the UK finally here. 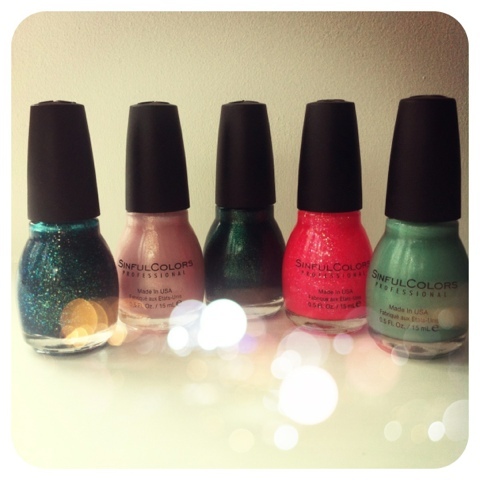 Have you tried Sinful Colors? What do you think and which are your favourites?